Athens, ca. 3rd century BC. AE 15. 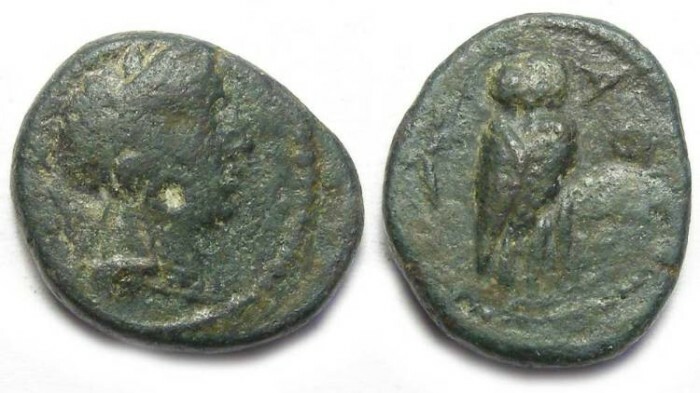 Date : Struck early in the 3rd century BC. Size : 13.5 x 15.5 mm. Weight : 2.77 grams. Reference : Svornos plate 22, #65 variety. Sear-2565 variety. Reverse : Owl standing slightly right with head forward, with a AQE to the right, and an olive sprig to the left.